Granada v Real Sociedad belongs to the group of fixtures which one does not tend to eagerly anticipate. Both teams are, however, interesting in their own different ways. For the home side it is the prospects they have on loan from Europe’s biggest clubs, especially since the departure of Paco Jemez. With the likes of Jeremie Boga and Victorien Angban on loan from Chelsea, Andreas Pereira from Manchester United, Ezequiel Ponce from Roma, Jon Toral from Arsenal, and none other than Sergi Samper from Barcelona, there are few clubs in Europe with such an array of exciting young talent. For anyone wishing to keep an eye on some of the most talked about youngsters in European football, Granada is certainly a team to watch. Real Sociedad are impressive for a much more conventional reason. The team from San Sebastian have had a great start to the season, highlighted by a great league win at home to Atletico Madrid and well deserved point against Barcelona. Managed by ex-Barcelona assistant and B team manager Eusebio, they have played some very attractive football of late, combining strong positional structures with effective dynamics, helped in no small means by the talents they are able to deploy in midfield. The first half began as most of the game would continue, with Real Sociedad forcing Granada deep into their own half. In the initial stages, this seemed to be part of the Granada game-plan. In the odd instance when pressing the Sociedad back line, Boga and Mehdi Carcela would push up next to Artem Kravets, creating a temporary 4-3-3. When the ball was with one of the central defenders, the ball-near winger would sprint to cut off the passing line to the Sociedad fullback, looking to force play through the middle where they would attempt to crowd out any potential attack. While this idea was a sound one, it did not work in practice for a couple of reasons. First and foremost, Sociedad’s fullbacks were very reserved in their positioning during deep build-up phases. It has become very common to see teams build with two players in the first line, fullbacks pushed high and wide to occupy the opposition midfield. Sociedad, however, primarily would build up with a clear back four. Though this might seem an odd idea, the effect it had on Granada’s pressing was greatly beneficial. Since the fullbacks were most definitely in the first line, any pressing run to place them in a cover shadow would have to be considerably longer, as well as opening up more vertical options for the ball-carrier. With the fullback starting deeper, he also gave himself plenty of space to run for third-man runs for example. It was through this mechanism that Sociedad were able to exploit the second problem Granada faced – namely that their pressing was somewhat uncoordinated. After directing the play into the centre, there was a lack of pressure on the subsequent passes, allowing Sociedad to escape easily and progress onto the next line. Granada’s uncoordinated pressing allowed Sociedad many avenues of progression – either through their deep fullbacks or through their indented wingers. When not applying pressure on the opponent’s defensive line, Granada took a more passive approach. Sitting fairly vertically compact in a 4-5-1, their three central midfielders were mostly extremely close to each other, position-oriented, while trying to cut out passes to the Sociedad players behind them. In this regard they were not very successful. The away side were able to consistently penetrate through the left halfspace, exploiting the spaces either side of Toral with alarming frequency. Once Sociedad had managed to find a pass through the Granada midfield line, the response was often sufficient to prevent them from progressing further in the first instance – with that player being subject to the immediate attention of any surrounding Granada player. Although this prevented many immediate progressions, by narrowing in on the first receiving player, a wider play was left free – more often than not this was Yuri. There was also sometimes significant forward pressure applied by an out-rushing central defender, although this was often prevented by Real by their occupation of the last line and subsequent threat of the considerable space behind the defence. Eusebio’s side were able to comfortably establish positional attacks thanks to their manipulation of the Granada defensive system. This was in no small part down to the supporting movements of players ahead of the ball. 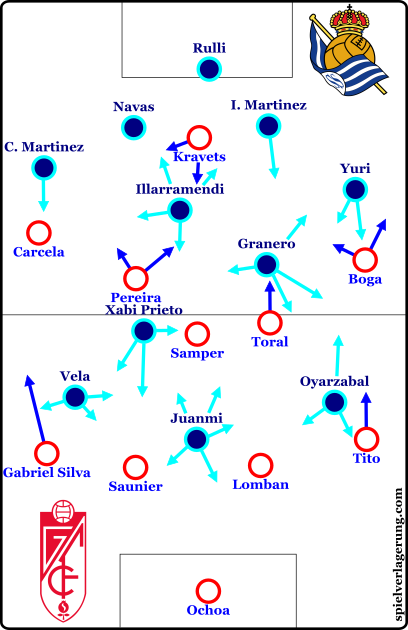 With Granada looking to block passes into advanced Sociedad players, their ability to continuously either move out of cover shadows or to allow someone else to move into a free passing lane was one of the prime reasons for Granada’s issues and one of the most impressive aspects of Sociedad’s game. Juanmi’s movement and the subsequent reaction from his teammates formed a key part of Sociedad’s ability to break through that side. As mentioned already, most of Real Sociedad’s penetration came through the left halfspace. Inigo Martinez was integral in this respect. The left sided central defender would carry the ball forward into the space beside Kravets, often not at any great speed due to the passivity of Grenada’s pressing. From here, he could directly confront a midfielder – usually Jon Toral – and free up a teammate to move behind the midfield line of pressure. This was almost always Esteban Granero – the ex-Real Madrid and QPR midfielder positioning himself behind and between players in order to receive flat, direct passes from Martinez. On occasion, Oyarzabal would indent to further overload this area, but it was the movement of Juanmi which was most impressive. 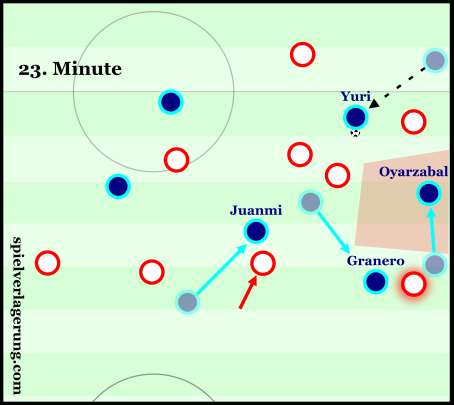 Starting from the offside line, the striker would move rapidly to take up a position from which he could receive penetrating passes from Martinez, while Granero would make a counter-movement forwards, in order to maintain Sociedad’s presence in the last line and to “pin” the central defender trying to track Juanmi’s run. This was not the only dynamic which Granero was involved in. His relationship with Oyarzabal was very fluid also. The left winger would often make dropping movements either back down the line or slightly infield in order to receive from Martinez or Yuri at left back. In these situations, Granero almost always reacted quickly to his teammate’s movement and made diagonal runs in deep towards the flank. While his interactions with Juanmi were more for balance and maintaining presence in a strategically important area, with Oyarzabal the function had its foundations in penetration. Granero would wait for Tito to react to the winger’s movement by following him, then burst into the space left behind, where he could receive longer direct passes in plenty of space and force Granada further back. Although a Granada midfielder would usually track this run, due to the nature of their defensive coverage – i.e. keeping the Sociedad midfielders behind them – once Granero started to make this run, any back-tracking Granada midfielder would be on the wrong side to make any meaningful attempt at stopping him from receiving. Though most of Sociedad’s successful penetrations came through the left side, this was not their only approach. Inigo Martinez’s strong range of passing allowed him to directly find Carlos Vela on the right flank – bypassing Granada’s attempts at strong horizontal compactness in the left halfspace. Here, Vela was actively supported by Carlos Martinez as well as Prieto and Illaramendi inside him, offering him strong connections to play the ball away from the flank were he to so choose. However, most of Sociedad’s attacks from these wider areas resulted in crosses. While crossing is noted as an inefficient strategy, Sociedad gave themselves as good a chance as possible at both creating shots on goal and at keeping possession should anything be cleared outside the box. Their box-presence was very strong, with almost all crosses being attacked by three players inside the box, giving them a good chance of getting on the end of a delivery, while their coverage of the areas outside it was impressive as well. One of the eights, Illarramendi, and the ball-far fullback who would indent, would cover areas the width of the box, effectively maintaining attacks and preventing counters as much as possible. Indeed, both their goals came from crosses, with the first being attacked by four in the box with Illarramendi and Carlos Martinez covering the space in front, and the second after a deflected cutback from the edge of the six-yard box – not a bad place to deliver the ball from. The second half was one of changes and counter-changes. Granada substituted the injured Jon Toral for Chelsea loanee Victorien Angban, and started the half with a much more aggressive pressing approach. Boga and Carcela swapped wings but still continued to press higher up the pitch in the first phase. Granada’s midfield was quite man-oriented in Sociedad’s deep build-up, trying to prevent them from establishing positional attacks. However, the away side were able to bypass this on many occasions through Geronimo Rulli’s excellent distribution. The Argentine could consistently pick out deeper players in space with long throws or pinpoint accurate kicks. Due to the man-orientations, Granada often appeared to press in a 4-2-3-1 shape, where Pereira would be tasked with maintaining access to Illarramendi. Once Sociedad started to escape the press, though, he would drop back to the left side of the midfield three and perform his usual role. Samper was notably more aggressive in his pressure, often rushing out from the centre of the three to apply anticipatory pressure on a potential receiver, while Angban was much more effective in his role of blocking passes through Sociedad’s left halfspace than Toral was in the first half. Real Sociedad’s midfield staggering and their manipulation of Granada’s man-orientations allowed them to escape pressure with ease. Despite the increased pressure place on them, Real Sociedad still managed to maintain total control over the game. Switching Oyarzabal with Jon Bautista and moving Juanmi to the left side, they were still able to relentlessly attack the space behind the Granada defensive line, whilst also have the option to use Bautista as a mobile target man of sorts to bring others into play. Whereas in the first half Granero was the advanced fulcrum, in the second it was Xabi Prieto. The captain was very astute positionally, consistently making himself an option in the right halfspace as Inigo Martinez brought the ball out on the opposite side. He often acted as a right sided number 10, helping to stagger the Sociedad midfield. This was particularly evident in his role when pressing, as he’d push up next to the striker initially then look to maintain access to the deepest midfielder when the ball was forced to the side he wasn’t covering. After the second goal the game petered out, with several changes affecting the game in a minor way. The introduction of Ezequiel Ponce for Kravets gave Granada much more dynamic up front, both in pressing and in chance creation. Alberto Bueno came on to move the home side to a definite 4-2-3-1 to no great avail. Real Sociedad continued their impressive first half of the season with a controlled performance. Though they might be very direct in their chance creation, their constructive play is very impressive, owing much to the work of Eusebio. That they currently sit ahead of Atletico Madrid is no fluke. Granada on the other hand have some serious work to do if they are to escape relegation. Their first half approach was criminally passive, while their more aggressive pressing was not co-ordinated well enough to prevent them from being cut open. Excellent! Thanks for analysing this La Liga fixture.